"You have played your game well, but with all the odds of the position in your favour, I am tired, beaten. The match is over, and you may rise now and say Checkmate." Do not, under any circumstances, read anything about this book that gives away the ending. 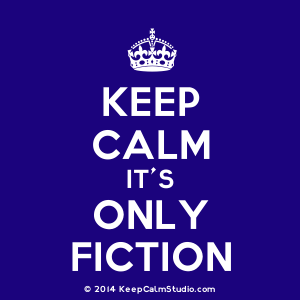 There is a major plot twist, the likes of which just might possibly be the first of its kind in mystery/crime/detective novels up to this point (1871) and it would be a shame to ruin it by knowing it even before getting started. Irish writer Joseph Sheridan Le Fanu (1814-1873) is probably best known for his supernatural tales; he has written some of the best ghostly or otherworldly stories in the genre, and his works are nowadays considered as classics. His novella Carmilla is famous; his short story "Green Tea" has been anthologized everywhere, and his "Schalken the Painter" is a veritable supernatural shocker. Le Fanu's work also influenced a number of authors: his House by the Church-Yard, first serialized 1861-1863, was a favorite of James Joyce who supposedly used it as a source when writing his own book Finnegan's Wake; according to the Oxford Dictionary of National Biography, W.B. Yeats, "acknowledged a debt" to Le Fanu's In a Glass Darkly in speaking of his play about Jonathan Swift, and then there's author Elizabeth Bowen, whose "post-Second World War fiction, beginning with The Demon Lover and Other Stories (1945), owes not a little to Le Fanu's disturbing blend of the occult and the banal." But Le Fanu moved beyond the supernatural as well -- for example, his Uncle Silas (1864) remains one of my favorite Victorian novels ever. According to The Saint James Guide to Horror, Ghost and Gothic Writers, while he used "gothic motifs" as "background," he "sought to develop character and everyday incident to dictate his story." (357) Julian Symons notes in his Bloody Murder that Le Fanu should have been established as "one of the most important originators of the crime novel," but sadly, "in this respect he has never received acknowledgement." 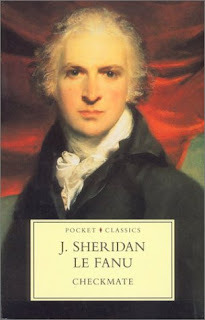 (60) Le Fanu today is studied widely in academic circles, and as the article in the ODNB states, Le Fanu's "transgressions across the boundaries of gender, genre, and nation have assisted a revival of interest the late twentieth and early twenty-first centuries." Unlike the previous recent decades of my reading project, when police-detective fiction seemed to be all the rage, Checkmate doesn't really follow in that category. There is a shady ex-detective named Paul Davies who makes an appearance here, and he does play a role in what happens, but he had been previously been dismissed from the force. His character seems to be representative of a trend between the 1870s and 1880s, which, as author Ian Ousby notes in his Bloodhounds of Heaven, begins as the public starts to change its attitude toward "the police detective," in a "dethronement of a minor cultural hero." (136) Instead, in Checkmate, we find a mix of gothic, sensation fiction, and well-crafted mystery to enjoy. For the first time ever, I'm refusing to comment on the plot because quite frankly, to say anything would be a travesty for anyone considering reading the book. Thinking back on it now, I realize that Le Fanu had scattered a huge number of clues across this book's 339 pages from the very beginning, and it wasn't really until the end that their significance became obvious, so I don't want to wreck anyone's experience. I will say that it's a story that kept me reading, especially because of the bad guy in this book whose villainy, in my humble opinion, surpasses that of any of the characters encountered in the British novels I've read so far during this project. By the last quarter of Checkmate, I was actually hating him, and to his credit, Le Fanu managed to take this story right down to the wire so that I had no clue as to whether or not things were going to turn out all right. It was yet another book where my tension level was so high over the last few chapters that I may have forgotten to breathe until the last word. The back cover calls it a "chilling mystery," and I have to concur. "If you can conjure up all this, and the superstitious freaks that in such a situation imagination will play in even the hardest and coarsest natures, you have a pretty distinct idea of the feelings and surroundings of a tall man who lay that night his length under the blighted tree I have mentioned, stretched on its roots... looking vaguely into the darkness." Le Fanu also has this way of inserting certain ideas into his work that are so strong that a reader just can't shake them off, which generally turn out to have a huge bearing on what happens in the story. In Checkmate this happens more than a few times, but there is one passage in particular that struck me. Here our villain is waxing mystical with the woman he has set his sights on marrying, and says "There is at present at the birth of every human being a demon, who is the conductor of his life," and then goes on to remark, "....and to families such a demon is allotted also, and they prosper and wane as his function is ordained." I had marked several of these sorts of things and going back and looking them over after having finished, I realized how very closely each had hit the mark. The book is also appropriately titled, once you figure out exactly how cunning our villain truly is. These short passages really do work as clues in understanding what is happening here, so the book requires some bit of patience, care, and thought in the reading, and is therefore, not a book to buzz through in a hurry. Hell, I could talk about this book forever because there's a lot here, but well, time and all that, along with the fact that while I'm in love with these old, forgotten crime novels, with Le Fanu, and with sensation fiction in general, I know that not everyone shares my zeal. My guess is that it will appeal mainly to fans of this author and to people who are seriously into Victorian sensation novels and Victorian crime, so once again I'll call it a niche read I can highly recommend.